Register now for 2019 Golf Classic! Please join us on Friday, May 17, 2019, for the 13th annual Lincoln-Sudbury Boosters Golf Classic, 7:30 am shotgun start. The experience of L-S athletes is greatly enhanced as a result of generous contributions to L-S Boosters. Since 1991, our supporters have made it possible to donate more than $1 million to L-S Athletics, impacting 33+ varsity, junior varsity, freshman and club sports. Recent contributions include vans, safety equipment, lighting, coaching education, training materials, and track resurfacing. Please help us maintain the high quality of programs offered to our athletes by sponsoring the Golf Classic and/or joining us to play on May 17th! THANK YOU to our tremendous community of supporters! View the 2019 Golf Classic flyer. 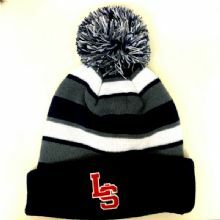 One Size Fits All Navy, white and gray stripped unlined knit hat with red LS embroidered.